Oklahoma’s legal real money poker and gambling stance can best be described as dichotomous. The Sooner State houses more casinos than almost any other state in the US, yet only two of OK’s casinos are permitted to offer table games and real cash poker games like Texas Hold’em. And while most forms of gambling and betting are regulated in Oklahoma, the state’s gambling statues are among the strictest we’ve encountered when it comes to Internet poker as well as land based real money lawful poker. Compounding matters further, it appears that Oklahoma’s gambling laws are vigorously enforced by the state’s law authorities – a true rarity. So where does that leave online poker and Internet poker websites? Surprisingly, the issue of real money gambling on poker websites has already been addressed by one of OK state’s numerous tribal factions. Furthermore, other forms of online gambling besides real cash Internet poker already exist within the state of Oklahoma. That said, there hasn’t been a single word spoken by government officials regarding an authorized piece of iGaming legal Internet poker legislature. And it’s hard to say if they’re ever will be. For those of you in Native America looking to make a wager on the virtual green we have found what you may be looking for. Oklahoma gamblers: discover real money US poker sites that you can easily access a free account. 3 Can Players From Oklahoma Play Online Poker? 4 Is Online Poker Legal In Oklahoma? In 2013, the Cheyenne Arapaho Tribe of Oklahoma entered an agreement with the state of Oklahoma to provide social online gaming, not including Internet poker betting for real cash, to international territories with the stipulation that 20 percent of all real money revenues would go to the state . Months after, the US Department of the Interior refused the legit Internet gambling deal, but not for the reasons one would expect. Instead, it revoked it because the state of OK was not offering any meaningful concessions in exchange for the 20 percent of revenues. In other words, the federal government was trying to protect the tribe from making a raw deal. In September, the real money Internet betting agreement was amended in favor of the Cheyenne Arapahos and now it mentioned legal Internet poker in OK in it. Under the new conditions, the tribe would pay the state 10 percent on all real cash betting revenue generated from non-house banked games (including real money poker), and less on electronic gaming revenues. It was promptly rejected again. This time the Department of the Interior stated that Oklahoma couldn’t offer a service like Internet gambling to a market of real money poker playing patrons located exclusively outside of the United States. In response, the tribe, which operates two Lucky Star Casinos and real money poker rooms in Oklahoma, filed a lawsuit asking that the feds stop interfering with its affairs . Should the Cheyenne Arapaho become iGaming Internet poker operators, it would mark an unprecedented victory for the tribe and iGaming poker websites in general. Can Players From Oklahoma Play Online Poker? Not all legit online poker websites accept players from Oklahoma, as the state’s stringent anti-gambling laws likely scared some gaming and Internet poker operators away. Thankfully, we’ve managed to put together a comprehensive list of reputable real money poker websites willing to take a chance on players from Oklahoma. Our recommended real-money poker sites are currently offering some of the best first-time real cash poker deposit bonuses on the planet, and are well-known for their exemplary customer service and prompt payment schedules. Most importantly, they allow residents with few iGaming Internet poker options the opportunity for poker gambling fun from the comfort of their own homes. Online poker is not specifically addressed by Oklahoma’s gambling and betting statues. However, there are laws in place that explicitly prohibit all forms of unlicensed gambling and the transmission of gambling information, that could very well apply to online poker websites. Compounding matters, the penalties for violating Oklahoma’s sweeping gambling and poker betting statues, especially as a real money poker operator, are quite severe. We unfortunately cannot provide you with an accurate answer regarding the legality of online poker at real cash Internet poker gambling websites in Oklahoma. What we can do is prepare you so that by the time you do speak to a legal professional, you’ll be equipped with an arsenal of useful poker websites information. Notice that if the parties do not recognize the chance element of a game, the act of wagering or gambling is not considered a bet in OK. This caveat may be of some use to professional real cash poker players, who largely see real money poker as a game of skill. Section 21-941 reads: Except as provided in the Oklahoma Charity Games Act, every person who opens, or causes to be opened, or who conducts, whether for hire or not, or carries on either poker, roulette, craps or any banking or percentage, or any gambling game played with dice, cards or any device, for real money, checks, credits, or any representatives of value, or who either as owner or employee, whether for hire or not, deals for those engaged in any such game, shall be guilty of a felony. If convicted, illicit gambling operators face fines ranging from $500 – $2,000 and a jail sentence in an OK prison of one to ten years. Yet, the term poker is noticeably absent from Section 21-942 – Gambling Playing-Penalty. However, cards do make an appearance. The penalties for participating in any real-money game involving cards, dice or any other device which may be adapted to or used in playing any game of chance is subject to a misdemeanour in Oklahoma, potentially resulting in a fine between $25 and $100 and up to 30 days behind bars. The section Dissemination of Gambling Information (Section 21-987(A)) is the closest the statues come to addressing the issue of iGaming and Internet poker. It reads: Dissemination of gambling information is the transmitting or receiving, by means of any communications facilities, information to be used in making or settling bets. Violating the law is a felony. Although the legality of online poker websites has yet to be debated in an Oklahoma court of law, the Dissemination of Gambling Information clause could easily include Internet wagering and real money poker websites in OK under its broad scope. The gambling and betting law also states that social gambling like a home game of real money Texas Hold’em poker, regardless of whether a rake is taken or not, is also illegal. It also appears that real cash poker cannot be played at a regulated charitable gaming venue. To view the entirety of Oklahoma’s statues , please visit the “References” section. As early as the mid 1800s, makeshift horse racing gambling facilities littered the Indian held territories of Oklahoma. It was commonplace for the tribes to cross into Texas to compete with their southern neighbors, sometimes in the name of friendly rivalry, often times not. Around the same time, roulette and other games of chance and real cash poker were played in frontier saloons in OK.
Legal poker gambling and lawful real money betting continued to run rampant in Oklahoma throughout the latter part of the 19th century and into the 20th. It wasn’t until after the oil boom of the 1920s that the state of Oklahoma began cracking down on illicit gambling activities. Regulations on betting games like real money poker were slowly put into place, and by the middle part of the 20th century, legit gambling and betting venues were virtually nowhere to be found. Then in the early 1990s, Oklahoma’s gambling and legit poker betting industry boomed. It was around that time that Indian tribes were permitted to open casinos and real money poker gambling facilities, something the state’s many tribal factions took full advantage of. Within years, bingo halls littered the state, some of which would go on to offer table games and legal real cash poker in Oklahoma. The WinStar World casino, in particular, is noteworthy for its 46-table real money poker room and varied lawful poker tournament offerings . Today, Oklahomans can pick their poison from one of nearly 60 – yes, 60 – casinos and legal real cash poker rooms spread across the land. Next came charitable gambling and a statewide lottery, which later expanded into a multi-state lottery, further increasing tourism from gambling fans and state revenue from the real money betting profits. To date, real money poker has not been approved at charitable gaming venues. Most recently, the state introduced a form of legal real cash online bingo to its residents. Most major forms of gambling and betting with the exception of commercial casinos and real money poker rooms, are legal in Oklahoma. But who needs commercial gambling when there are literally dozens of tribal casinos offering games like Texas Hold’em poker sprinkled throughout the state of OK? Poker players in Oklahoma are playing online, but it may take quite some time before there’s a move to legalize online poker rooms. 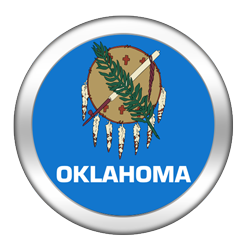 Oklahoma is one of only a handful of states that addresses the legality of online poker and Internet poker real money gambling, albeit indirectly. And despite its influx of casinos very few of them offer real cash poker betting. Oklahoma State’s conservative voters are vehemently opposed to gambling and Internet poker expansion, and OK state officials are in no hurry to address the issue of legal poker websites for OK residents. All told, the aforementioned variables lead many industry experts to believe that Oklahoma is not likely to ever regulate online gambling or real cash Internet poker. That said, Oklahoma’s two largest casinos do offer real money poker, and they are among the most profitable gambling facilities in the entire state of OK. This is no coincidence. Online bingo betting has also proven quite popular among locals. Given this, it’s at least possible that Oklahoma may one day permit online poker websites, but we’d still assess its chances of Oklahoma launching lawful poker websites as below average. The Oklahoma State Championship of Poker takes place at the Hard Rock Hotel & Casino in Tulsa. The Main Event features a $1,090 real cash poker buy-in and a $50k guaranteed poker gambling jackpot . It’s entirely possible that if Oklahoma’s overwhelming tribal populace begins pushing hard for online poker and lawful Internet poker, the state will buckle under its demands. Even if that doesn’t happen, if enough nearby states hop onto the iGaming poker websites bandwagon, Oklahoma’s gambling and poker betting industry will undoubtedly falter, forcing OK state officials to at least examine a new strategy which could include giving the go ahead to legal real money Internet poker websites. However, Oklahoma’s small population of 3.8 million residents may limit its ability to operate a thriving iGaming Internet poker market in OK without an interstate Internet poker compact in place. Thus, don’t expect Oklahoma to be a part of the next wave of states that pass iGaming real money poker websites legislation.